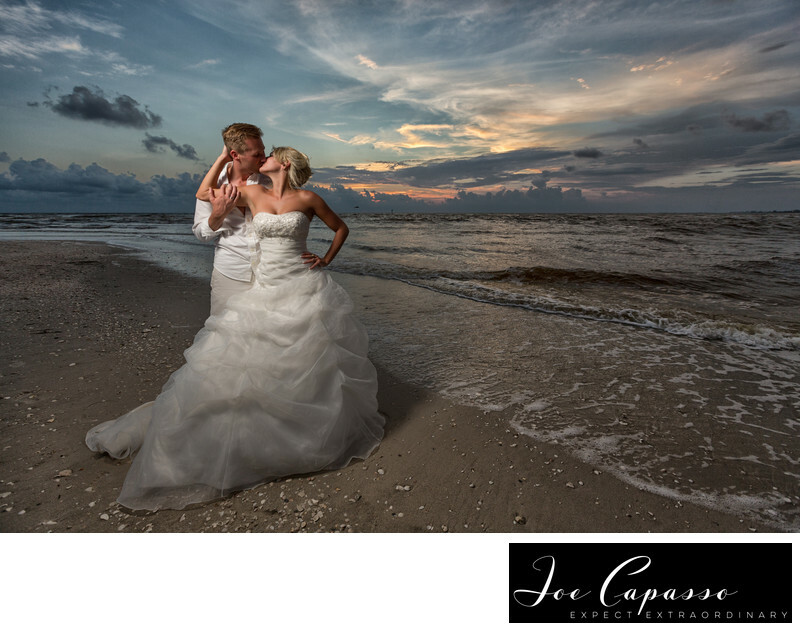 Anna and Patrick flew all the way from Germany to have us photograph their wedding in Naples, Florida! This picture was taken at Wiggins Pass State Park in Naples. It's where they decided to have their wedding ceremony. We worked with the couple to schedule their ceremony so it ended an hour and a half before sunset. This gave us plenty of time to take family portraits immediately following the ceremony. At that point, we had a whole hour to take portraits on the beach all the way up until sunset. This photo was taken just after the sun went down. Sometimes the best beach photos are taken at dusk, just as the sun passes the horizon. Patrick proposed to Anna on a trip to Naples Beach from Germany. Since they were engaged in Naples they thought it was fitting to call it official in their favorite place! We used some off camera lighting in this portrait to add some drama. My assistant Frank is standing camera left with the flash. My ambient exposure was calculated first, then we added just enough light to make the image pop off the screen. You can find more of this Naples wedding in the blog section. You can search for Wiggins Pass State Park in the blog section of our website for more amazing photographs of this couple! Location: wiggins pass state park, naples, florida. Keywords: florida (6), florida photographer (6), miami wedding photographer (12), naples (12), naples photographer (18), naples wedding photographer (45), wiggins pass state park (3). 1/320; f/5.0; ISO 200; 16.0 mm.